It was around February when I thought of buying another genuine leather purse. That time, I was eyeing for a pink bag and almost bought the MICHAEL by Michael Kors Small Jet Set Travel Tote in pink saffiano leather. Realizing that it's harder to clean a pink leather bag, I finally settled with this MICHAEL by Michael Kors Medium Jet Set Shoulder Tote in navy color. I called Michael Kors branches in Powerplant and Shangri-La and also requested hubby to call a Michael Kors branch in Istanbul if they carry the same product and how much do they charge for it. After considering the prices and taxes, I decided to order it from the US with the help of Gel of Jass Botiq, the same store where I bought the Victoria's Secret gift set. The bag arrived yesterday so here is my honest review of the bag. This MICHAEL by Michael Kors Medium Navy Jet Set Shoulder Tote retails at $198, plus tax and shipping fee. Its removable chain and leather straps allow it to be worn as a shoulder bag, as a tote or single for a long drop, and cross body. The bag's dimension is 12" in width, 12" in height and 3" in diameter. It is actually small but weighs around 500 grams. This beautiful golden Michael Kors logo charm can be attached to either the leather shoulder strap or to the chain handle. This is the MICHAEL by Michael Kors logo on one of the inner pockets. The interior features monogram or signature lining. It has a magnetic snap closure, one zip and four open pockets and key keeper hook. This is a close up photo of the inner zip pocket. Notice the detail of the zipper and the stitching. That's how an original leather bag should be. Lastly, I have here the care instructions and the tag price. So, what do I really think about MICHAEL by Michael Kors Medium Navy Jet Set Shoulder Tote? I say it is a must-have! The color is perfect for summer and even good for the entire year. It comes in classic colors like black, tan, vanilla, silver, and gold, and summer colors like blue, lemon, and orange. If you wish to have an affordable leather designer bag, I suggest you start with MICHAEL by Michael Kors. How much would that cost? I like to see luxurious bags but not buy them because I get "sawa" easily of the design and using them every day. In my case, I think I won't get "sawa" cos I have other leather, faux and canvass bags pa naman. Hihi. I know. Haha. I could've bought the pink one but I just don't know what to do if I stain it na. 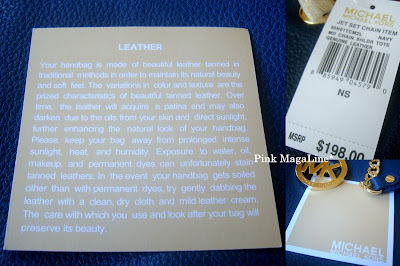 I like the pink one too...kaso mahirap talaga linisin...I have to stay away with light colored purses..nice choice sis! I saw one like this but different color for less than $130. I love how simple yet gorgeous this bag is! I can see myself wearing it during casual days particularly shopping days. I wonder if the shipping cost is pricey? Shipping within US is cheap. This one was shipped to my friend's MIL in Maryland then she brought it to Manila for me. It's nice that you have a friend in the US. It's cheaper when you buy bags over there! Nice buy! I love bags,locally or internationally made. With name or without a name. Got big problem here now in my closet need to have garage sale now. hehehehehee. Love your bag sis. Like the color too! you chose a wonderful color and style! I love that it pops out with any outfit and yes you can rock this from season to season. Blue is my favorite especially in autumn/winter palette. Nice choice ! I adore the pink one but have to agree with you what happens if we stain it! Haha Lucky you have a friend in US you can ship ur orders to mas mura talaga there eh kalurks dito times three! That bag really looks good to fashion addicts and hipsters. ooh, so lovely. I have been drooling my eyes on seeing those lovely MK totes and hand bags but i'm a frugal mom who needs to prioritize many things rather than my own desires, so for now, i guess i have to dream about it. How I wish I have enough budget to buy that kind of bag because seems that it is organized which is I really really like it. Though $198 is not bad which indeed it is not so pricey like the other brands.